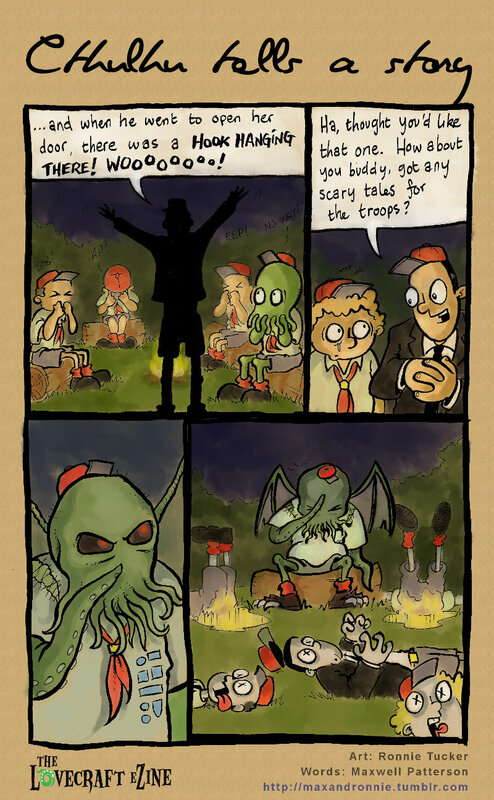 Cthulhu Does Stuff, #1 – click to enlarge. If you enjoyed Cthulhu Does Stuff #1, let Ronnie and Max know by commenting below — and please use the Facebook, Twitter, and Google Plus buttons below to spread the word. I wish you guys could get this published in my towns local paper. Oh no, not again… this is just like the time the ladies’ garden group asked me for my favorite recipe! A brilliant addition to the eZine! That last panel is priceless! Great comic. And something subtle for the non-Cthulhu reader out there. I love it! From the title to the last panel. Great addition to the magazine! These comics are awesome. Keep it in each issue.